The Chairman, Senate Committee on Power, Steel Development and Metallurgy, Senator Enyinnaya Abaribe, has explained why former Vice President, Atiku Abubaakar, returned to the Peoples Democratic Party. Atiku had in December formally returned to the PDP after few years with the All Progressives Congress. 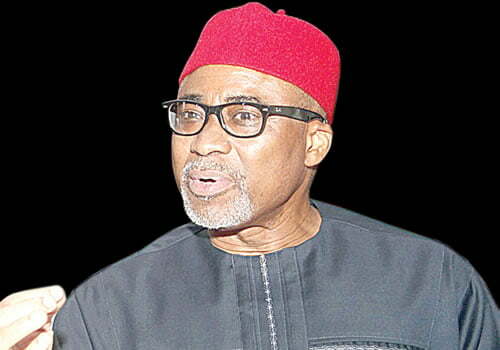 Abaribe, who doubles as Chairman, South-East caucus in the Senate, said Atiku and other members of the party, who earlier decamped, decided to return on realizing that the APC was thriving on lies and propaganda. He told Vanguard, “We think it is not just Atiku only. Most of the people who left PDP due to disagreements, we also encourage all of them to come back because they have now gone to taste APC and have seen. Our people say that when a woman marries two husbands, she now gets to know the one that is better. “I think it is now clear to them that APC was simply something that was set up merely to take over power from PDP based on a bunch of lies and propaganda that they dished out to the Nigerian public and of course, we are not saying that PDP didn’t also make its own mistakes, yes, they did. But we didn’t think that those mistakes were also enough. But be that as it may, PDP also taught APC lessons in civics. The senator stated that Buhari had kept Nigeria’s economy in comatose by using his own words to demarket the country, telling everybody outside that the country was a country full of crooks. “It took him six months to even make a simple decision of finding a cabinet for himself. And of course, that malaise has continued till today. And so decisions are pending. One year after, he would not take those decisions. He has kept the economy in comatose, used his own words to demarket the country by telling everybody outside that the country was a country full of crooks and all that, of course, he was the only good person. And of course, when you go outside your own country and call your own country corrupt, what do you think will happen? Investments will move out of your country because international investments don’t go to corrupt places. “What they do is to find safe haven, make sure that they can get a return for their money. So at the end of the day, we have all come out to see that the APC didn’t have an economic strategy in place. And we are now working on the basis that ‘oh, we will learn as we are in the office’ and that has cost Nigeria greatly.